Connect one VGA monitor and one DVI monitor to your DMS / LFH graphics card.. 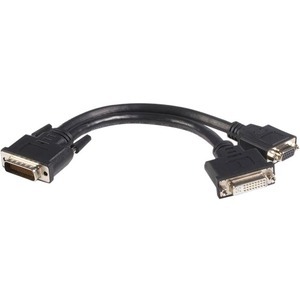 This DMS 59 to DVI and VGA Y cable allows you to break out one LFH 59 or LFH 60 (DMS 59 and DMS 60) connection on Matrox Qid, nVidia Quadro, and PNY Quadro cards into one DVI-I dual link female connector and one high density DB15 female connector, letting you to connect one VGA monitor and one DVI monitor for a cost-effective dual display solution. Expertly designed and constructed of only high quality materials, the DMSDVIVGA1 DMS 59 to DVI and VGA Y cable is backed by our Lifetime Warranty.